The activity of the cambium ring is influenced by the climatic charges. Reactivation of the cambium takes place during spring season. The cambium becomes more active during this season and forms plenty of xylem vessels with wider cavities known as spring wood. It is also known as early wood. In winter, however, the cambial activity slows down and gives rise to narrower xylem elements. The wood thus formed in winter is called autumn wood. It is also known as late wood. It is formed during winter season. It constitutes the major part of the annual ring. It constitutes as a narrow strip in the annual ring. Spring wood is present in the beginning of an annual ring. Autumn wood is present a the end of an annual ring. Forms plenty of xylem vessels with wider cavities. The cavities of xylem vessels are narrower. Xylem fibers are fewer in number. Abundant xylem fibres are produced. Wood is lighter in colour. Wood is darker in colour. 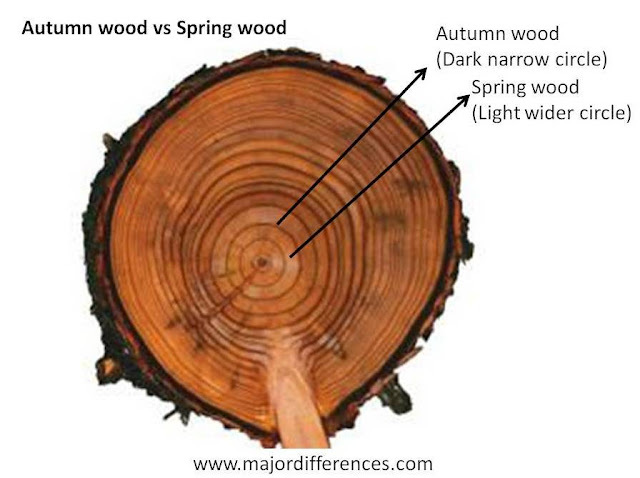 It is also called early wood. It is also called late wood.